I could never have imagined myself reading a book by a Nobel Prize-winning economist, but I have, and to my profit. Daniel Kahneman’s Thinking, Fast and Slow has helped me understand more about how I think, make decisions, communicate, and respond to the words and actions of others. His basic idea is that we have two different modes of thinking and processing information. The first mode is automatic and impulsive. It’s our knee-jerk response that enables us to take short cuts and move on with ease. The second mode is more deliberate, focused, logical, and it’s necessary for making truly wise choices. Some of us tend to react instinctively, go with our guts, and sometimes miss things that are critical. As an ENFP (Myers-Briggs Type), I’m one of them. People need to spend most of their time in the first mode because we haven’t got the time or the stamina to carefully examine every decision we make. Some things just need to be automatic. However, we can become lazy thinkers, and take short cuts when we shouldn’t, and not slow down when we really should. We are all prone to making snap choices—weighing up people and situations in an instant. We oversimplify, latching on to something we like and assuming that we will like everything. This can lead to major errors in judgment. Let’s say I’m considering someone for a job. I learn that they love fishing, camping and four-wheel driving. This leads me to gravitate towards them. We spend time chatting about our common interests, places we’ve been, experiences we’ve had. I like them. Hence, there is now a bias toward preferring this person regardless of what experience they might have had in the job, how competent or incompetent they are, whether they are a team player or prima donna, or any other critical criteria. This has been called the halo effect. We assume they will be good even though we know very little about them. Similarly, I might know some details about a person, such as where they trained or who they’ve worked with previously. I associate what I know about them with an ideal that I’ve created. If I’ve had positive experiences with the people they know or with the training organisation they come from, then confirmation bias may lead me to make assumptions about them and not do due diligence to get more relevant information specifically about them. I wonder how many people employed on the ‘it’s not what you know, it’s who you know’ principle, have turned out so differently to what was expected. Taking short cuts might save time in the short term, but may lead to drawn out disasters in the longer term. Kahneman discusses how we perceive statistics, memories, risks, choices, and more. He shows how our perspective shapes how we respond to things. For example, if a shopkeeper is told that there is a 1% chance that someone entering her shop will be a shoplifter, then she might not worry too much. But, if she was told that of the 1000 people who will come through her shop this week, 10 of them will be shoplifters, you can imagine she will be on high alert for who they might be. The statistics are identical but each statement offers a different perspective. Context is also important for weighing decisions. If two people are both promised that by the end of the year they will each have a net worth of $100 million, then you’d expect them to be equally happy, wouldn’t you? If one of them was me, I’d be ecstatic. Who wouldn’t be happy with $100 million? If I told you that the other person was Mark Zuckerberg, whose current net worth sits at $75 billion, you can see how context changes everything! These insights will help us to be more effective communicators. Pausing to consider how people might ‘see’ what we are saying, will move us to take the extra step to get our message across more clearly. So often we think if something has been said then it’s been heard. But is their perception the same as our intention? It pays to be clear and it pays to enquire as to whether we’ve been understood. Thinking, Fast and Slow is a book to get us thinking about our thinking. While much of what we do needs to be quick and automatic, there are some areas where we need to disengage cruise control and put our minds into manual. In my work as a church pastor over many years I can see times when I took the lazy option and endured the consequences of not thinking hard or long enough. Now, I watch others fall into similar errors of judgment. While we know there is always more than meets the eye and we shouldn’t judge a book by its cover, we get lazy, we’re attracted by the short cuts. I hope that I will grow in wisdom, be a better judge of people, make smarter decisions, and communicate for effectively, as I seek to think both fast and slow. Take speaking at church for example: When an announcement is made before the whole church, does this mean that everyone has got it? Of course not. On any week there will likely only be 75% or so of regulars in attendance. Of these, some will be out with children or youth. One or two could be in the bathroom. Some might be vaguing out with other things on their minds. Others could be distracted by children, off with the fairies, or not grasp the importance or significance of the communication. The same is true of a weekly email or blog post. Some in-boxes are so full that people have given up on looking at anything. Others glaze over the email coming from the same person with roughly the same information week after week. Some spouses forget that they need to pass things on to their other half. And some simply don’t find the time to read them. For these reasons, and others, we need to consider the best ways of communicating things at church. Sometimes this will involve a verbal announcement at church, followed up by a notice, memo, email, blog post, leaflet or something else. Things might need to be repeated over more than one week so increase the likelihood of people hearing the news. At other times we might choose not to say things up front at church, so as to avoid clutter. Emails and blog posts are a simple means of getting information out, but they depend on people getting them and reading them, and sometimes they need to be followed up with verbal communication or discussion. Facebook groups can help alert people to things that are happening, as can an up-to-date website. I want to suggest another means of communication at church which could be a little controversial—good gossip! Spread the word among each other. When I say good gossip, I don’t really mean gossip. There is absolutely no place for God’s people to be telling stories about one another, putting each other down, grumbling, whinging or complaining. This is why the generation of Moses perished in the wilderness. What I mean is helping to keep each other informed, know what’s happening, and be encouraged in our love and service. So when you see that someone is missing from church, why not give them a call, send them a text, pop them a visit, or message them on Facebook—tell them you’ve missed them and let them know what they might have missed. We need to be patient with one another as we take time to get to know people, work out how things work ‘around here’, discover expectations, learn how to become better listeners, and explore good means of communication. By the way, if you read this on my other blog jamesfourfifteen.com, it didn’t hurt to read it twice, did it! 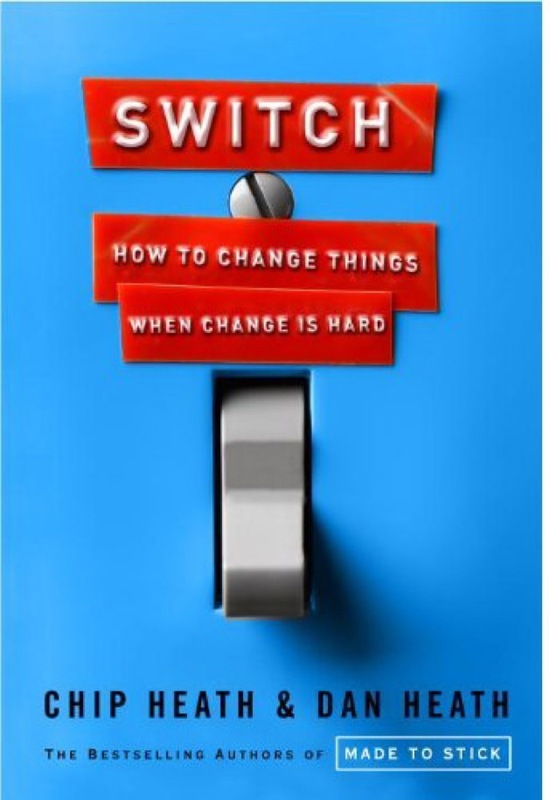 Switch: How to change things when change is hard is the third book I’ve read by Chip and Dan Heath. These guys are so helpful in the observations they make about human thinking and behaviour. This book tackles the topic of change and why we so often fail to make the changes we know we need to make. As one who continually fails to make the changes that I know I need to make, I was drawn in from the outset. The Heath brothers describe an obstacle that’s built into our brains—the rational mind competing with the emotional mind. The rational mind wants to look good in swimmers come summer, but the emotional mind likes the comfort of another Krispy Kreme doughnut. Given that I’m currently attempting to lose 17% of my body weight before Christmas—when I usually fail attempts like this—this news could prove very helpful! Switch draws on the work of Jonathon Haidt in The Happiness Hypothesis in describing the emotional side as an Elephant and the rational side as its Rider. The Rider holds the reins and would seem to be in control, but the reality is that a six-ton elephant will win every time they have a disagreement. Thus, the Krispy Kreme will trump the desire to look good in swimmers if the two get into a fight. The strength of the Rider is normally in his longer-term thinking, whereas the Elephant seems focused on short-term gains. When change efforts fail, the Elephant is usually to blame. But this doesn’t mean that the Elephant is evil—the elephant can be associated with very positive emotions, and he is usually the one who gets things done. The Rider is often the blockage because he tends to overthink and over analyse things. Change happens when the Rider and the Elephant cooperate. The Rider makes the plans and sets the direction, and the Elephant provides the energy needed to get there. Knowledge without emotion won’t get you anywhere. Emotions without thinking can take you anywhere. Synergy between the two is needed to complete the changes we desire. When there is a tug of war between the two, the Rider will quickly tire and give up. Self-control is exhausting and can only sustain change efforts for a short period. This is often because we are attempting to change things that have become comfortable habits; things we do on automatic. Sometimes it seems that people don’t change because they are lazy, but the reality is often that they are exhausted from repeatedly failed attempts. Sometimes change fails because the Rider doesn’t seem to know where he is headed. The Elephant is going in circles. It’s not resistance by the Elephant—it’s a lack of clarity by the Rider. If we want people to change then we need to provide clear direction. Direct the Rider. What looks like resistance is often lack of clarity. So provide crystal-clear direction. Motivate the Elephant. What looks like laziness is often exhaustion. The Rider can’t get his way by force for very long. So it’s critical that you engage people’s emotional side—get their Elephants on the path and cooperative. These are the best way to direct the Rider. Show him how to act, where to go, and how to get there by pointing out others who are already doing it well. Ask the question ‘What’s working and how can we do more of it?’ Often this question is ignored in favour of the question ‘What’s broken and how can we fix it?’ Focusing on the negative doesn’t help the Rider to have a solution focus. Too many options can make it difficult to make decisions. It creates disruption, uncertainty and anxiety. Too many options and ambiguity can create decision paralysis. Both make it hard for the Rider to direct the Elephant. If there are many paths and the Rider is unclear about where to direct the Elephant, then the Elephant has a tendency take the most familiar and comfortable path. The most familiar path is invariably the status quo—so nothing ends up changing. Some leaders focus only on the big picture and stay clear of the details. However, this doesn’t help the change process because the hardest part of change is in the details. Ambiguity leads to inertia and this must be overcome by scripting the most critical moves. Not all the details, just the most important for the change process. We need to explain the new way clearly—not assume it’s obvious. The tendency these days is to focus on SMART goals. The Heaths argue that such goals are good for steady-state situations because the assumption is that the goals are worthwhile. However, to persuade people and organisations to change requires people to be convinced of the new goals. This means addressing the emotion as well as the intellect. SMART goals rarely hit people in the guts emotionally. We need to generate a clear picture from the near-term future that will inspire people and show them what is possible. Most people think that change happens via the route of analyse >think> change, whereas the reality is that it is normally see>feel>change. Things need to impact the emotions, not simply the thought processes. Lack of change may not be the result of a lack of understanding. Most smokers find it very difficult to give up. They know that smoking causes lung cancer and a list of other problems. More information isn’t the solution. The answer lies in impacting the emotions—motivating the Elephant. Negative emotions can be powerful change agents, but they tend to have a narrowing effect—whereas positive emotions broaden and build our possibilities. They can stimulate hope, and joy, and creativity which are needed to sustain change. One way to stimulate change is to make people feel as though they are closer to the finish line than they thought. One study showed a car wash promotion with loyalty cards. Some people were given a card showing the eight washes earned a free wash. Others were given a car showing that ten washes earned a free wash. This group was given a head start with two washes already checked off. After a month or two, more of the ten-wash cards had earned free washes, illustrating that people found the head start worked as an incentive. Focusing on small wins also shrinks the change. The small wins must be meaningful and within reach. It’s easier to cope with a long trip if it’s broken down into smaller sections. Instead of seeing the journey as a 3000km trip, you can mark off the destination in 300 km intervals, and celebrate each arrival. This makes it easier to achieve small successes and this means more celebrating. The celebrations of achievement build hope—and hope is Elephant fuel! There are two basic models for motivating change: the consequences model and the identity model. The consequences model looks at the costs and benefits. It’s a rational, analytical model. The identity model involves us in essentially asking three questions: Who am I? What kind of situation is this? What would someone like me do in this situation? (p153) Change efforts that violate people’s identity are destined for failure. People will rise to match their identity in creating change. However, they will also fail. It’s important for people to have the expectation of failure. Not failure of the project or mission, but setbacks and disappointments en route. They should be challenged to keep growing through the struggles, so that they will succeed in the end. People should be encouraged to see falling down as learning and growing rather than failing. The Rider needs direction, but the Elephant needs motivation. Motivation comes from feelings and from finding confidence. The Elephant needs to believe it is able to make the changes. Shrinking the change and growing the people work together to build confidence. If we want people to change, we can provide clear direction (Rider), increase their motivation (Elephant), or, alternatively, we can make the journey easier (Path). Tweaking the environment is about making it easier for people to choose the right behaviours and harder to choose the wrong behaviours. This is why supermarkets put the milk in the far corner—so you will spend more time in the shop. An example I can apply to my diet strategy is to shrink the size of my plate. This way I will eat less because I simply can’t fit as much on the plate. Our environment can reinforce or dissuade habits. Sometimes if we change the environment it becomes easier to change the habit. It would be unwise for a recovering alcoholic to visit a bar, because it has a strong association with drinking. One strategy for motivating action and developing habits that motivate is to create action triggers. In a university study, students were given the opportunity to gain extra credit in class by writing a paper on how they spent Christmas Eve. But to get the credit, they had to submit the paper by the day after Christmas! Students were divided into two groups. One group was asked to set action triggers (noting in advance when and where they were going to write the report) and the other wasn’t. One third of the latter group managed to write the paper compared with three quarters of those who set action triggers. Action triggers preload the decision and make it easier to create an ‘instant habit’. When things are unfamiliar we tend to watch others to see how they do it. When we are leading an Elephant on an unfamiliar path, the odds are on it following the herd. Herds are powerful. Things become contagious. When one person is obese, the chances are that their friends will also be overweight. People tend to change their perceptions of acceptable body shape by looking at those around them. We consciously and unconsciously copy the behaviour of people close to us. There are different ways to create a herd. One is to publicise examples of the type of behaviour we are looking for. Another is to get like-minded people together and influence through example the right behaviour. People will start to be influenced by others to go with the flow of right behaviour. As a Christian following Jesus, I am pro-change. God is in the business of change—transforming lives. God is changing his children to become more like Jesus. So it makes me nervous about embracing a book on change that doesn’t mention God or discuss the transforming work of God’s Spirit. I’ve definitely got more work to do in analysing the transferability of a number of these ideas and strategies. Having said this, Switch has reminded me again that God has made us as complex beings. We are rational and we are emotional. We are influenced by our circumstances and we can seek to shape and change our circumstances. The tendency of my Christian ‘tribe’ is to emphasise the rational and overlook the emotional. Some other tribes tend to put it the other way round. My tribe can tend towards emphasising God’s sovereign control over all things and forget our potential to make changes for the better. While not being a Christian book, Switch has reminded me of some of the complexity of people and our circumstances. I remember many years ago, discussing with my pastor how I was planning to advertise a Christian conference I was organising. He told me that I needed to sell the sizzle, not just the sausage. I can now see that he was saying that I needed to motivate the Elephant as well as the Rider. If people were going to change their plans to come to the conference, then I needed to engage their emotions as well as their thinking. They needed to be excited about being there, not simply be told why it would be good for them. So we sought to excite people about going and persuade them that this would be the one event of the year that they wouldn’t want to miss. It doesn’t have to be manipulative or deceitful—simply addressing the whole person. This particular conference occurred during the mid-year break at university. For some people this was the first break of the year and they wanted to go home or head off to the snow. Families would sometimes put pressure on people not to go. The costs were reasonably high. It was important for us to shape the Path for people, to make it easier for them to change plans and come. We would prepare people months ahead to make their mid-year plans, knowing that last minute pressure from families would often keep people away. We would help with payment plans, incentive payments, and sometimes covering people’s costs, knowing that finances would prevent some from attending. I even offered a money-back guarantee if people weren’t persuaded it was time well spent! We would assist people with travel arrangements to help them get there. We’d encourage friends who were already going to make it easier for their mates to come. We made it a lot easier for people to choose the conference. I’ve observed that much Christian preaching is targeted toward the mind—as it should be—but doesn’t think much about people’s feelings or emotions. 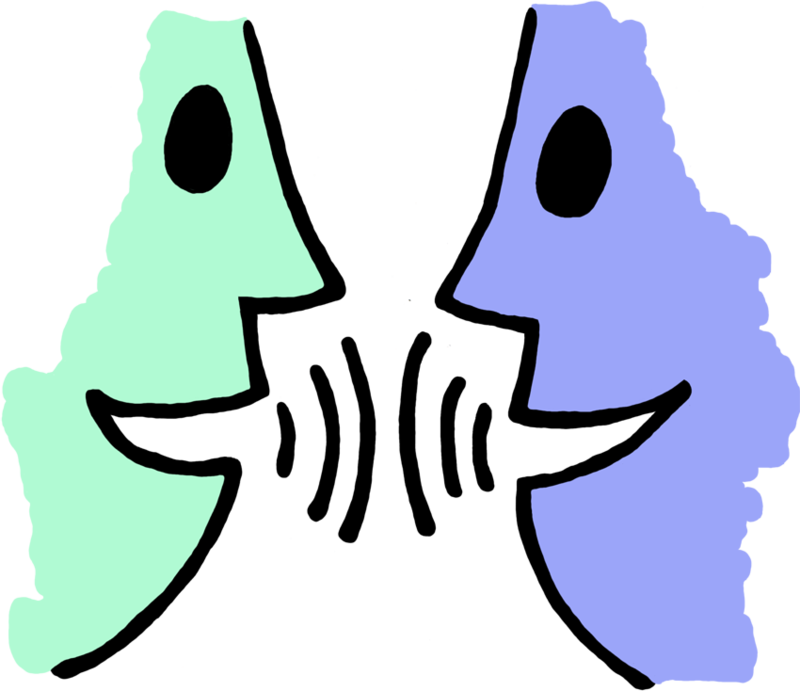 Aristotle described good communication as a blend of logos, ethos, and pathos. It’s not just words and arguments, but involves the character and life of the communicator, and their conviction and passion about what they’re communicating. This book has also helped me to think about how we tend to get people doing new things in our churches and organisations. Sometimes people struggle—they just don’t seem to get it. Perhaps we haven’t made things clear enough. Maybe we’re expecting people to join the dots for themselves. I’ve come to think that we often need to do more to script the critical moves for people—to help them make the transitions and changes. Switch isn’t the greatest book on change that I’ve ever read. That prize would go to the Bible—hands down. But it is an engaging and practical book for all who are seeking to see change in themselves, in others, and in organisations. There is much to be learned. In their book, Made to Stick, Dan and Chip Heath speak of a major problem with communication. It’s called the ‘Curse of Knowledge’. Once we know something, it becomes difficult to imagine what it was like not to know it. We subconsciously assume our audience know what we know. It makes it harder to share our knowledge effectively with others, because we’re not connecting accurately with our reader or listener’s state of mind. I was made aware of this recently when I received feedback from my editor on the first few chapters of my book. We are strangers to each other. She had not been reading this blog and knew nothing of my circumstances or background, other than what I’d written in the opening couple of chapters. It must have been like listening to one end of a phone conversation, trying to piece together what the other person was saying. She helped me to see all the assumptions that I’d been making about my audience. I had knowledge, therefore I assumed they did too. This is the curse of knowledge for the communicator. I had only shown these chapters to two other people. Both of them knew me pretty well. They understood the ‘other side of the phone call’. They could fill in the blanks. One of these people was my father, who knew my circumstances very well. For him my assumptions of knowledge were reasonable, but not for a potential book audience. Changes are needed. Gaps need filling in. It’s important for preachers and Bible teachers to be aware of the curse of knowledge. The more they study, the more they learn, the more they preach, the more they forget what others don’t know. How many times have I heard a preacher say things like, ‘You will remember what it was like for the people of God in the wilderness’. The preacher knows what he means and, to be fair, so do most of the people in his congregation. He is referring to the 40 years that Israel spent between being rescued from slavery in Egypt to entering the promised land of Canaan, under the leadership of Moses, as described in the books of Exodus to Deuteronomy. I don’t remember, should I? What was it like? Was it good? Or was it bad? Who were the people of God? Were these really special religious people? Is he talking about the Tasmanian wilderness or some other one? Surely, wilderness must be a metaphor. I’ve no idea what he’s talking about. There’s an in group here, and I’m not part of it. (Subconscious) Is it worth listening to this guy? I don’t know enough. I wonder what time this finishes? If we want to engage people, if we want them to connect with our message and stay with us, if we want them to understand and remember what we’re talking about, if we want to see people’s lives transformed, then let’s beware of the curse of knowledge. Over summer some of our tents got damaged. We had a major windstorm blow through the campground, causing trees and branches to come down everywhere. Two major rips in one tent and a dozen minor tears in the shade tarpaulin. Gaff Tape to the rescue! This tape is seriously potent stuff. It fixes the problems and it goes on easily. There’s really only one problem. You can’t get it off! You can pull the tape away, but the sticky residue remains as testimony to the holes it once covered. The stickiness sticks even after the tent has been professionally repaired. If only that were true of all my good ideas, all my sermons, all my visions for the future! Communicate and they stick – at least all the bits that really mattered. 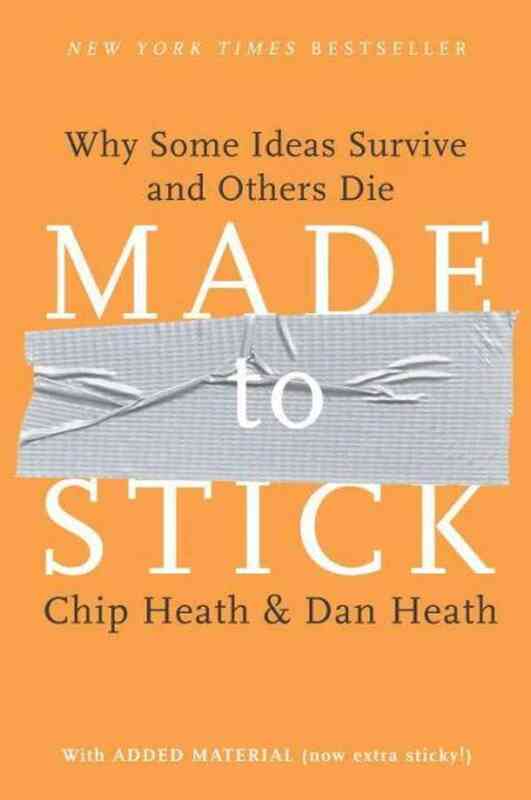 Made to Stick: Why Some Ideas Survive and Others Die by Chip Heath and Dan Heath is a book for people who want to communicate. Not just say things, but be heard, understood, remembered, and embraced. The authors have written this book for people who want their ideas to change people’s opinions and behaviours – that is, to make their ideas stick. As a pastor, I don’t want to be merely whistling into the wind. I’m keen for people to be excited by the message of God, to remember what’s important, to change how they think and speak and act, and to pass the message on to others. How sticky are my words and ideas? How much is remembered from my sermons? How do I go about seeking to communicate the life giving words of God? Sadly, I hear some preachers with a love for God’s message, who come across as boring as the paint job on a navy ship. And I hear others, whose messages are largely froth and bubble, a mix of cliches and pop psychology, who get remembered because they manage to communicate in a sticky way. A good message deserves to be communicated in the very best ways possible. This book offers some great ideas, and you’ll find that many of them are pretty sticky! This is not about creating sound bites or necessarily short messages. It has to do with stripping the idea down to its core. What is its essence? This isn’t about dumbing things down. It’s separating the interesting ideas from the important. It’s separating the important from the most important. It’s distilling the essential out of the most important. Then you’ve got simple. I see this as a trap for preachers. You’ve been working in a passage of Scripture, soaking yourself in it, picking out gems, discovering new paths, having the occasional ‘aha’ experience. You’ve worked hard in your preparation. There are so many things you want to say. And you do! You have enough different good ideas for a series of sermons and people are left wondering what on earth you said. Occasional preachers and student preachers are especially prone to this. If you only get to say things once every now and then, you’d better make the most of it. Yes! But that doesn’t mean saying everything! It means saying what you most want to say and making it stick. The most basic way to get people’s attention is to break a pattern. We tend to be creatures of habit and we get lulled into the security of consistent patterns. Unexpected ideas are more likely to stick because they make us pay attention and think. The extra attention sticks the ideas into our memories. I remember hearing a sermon by a friend, where he began by saying he had two important announcements to make. The first was that someone, let’s call him Tommy, was being kicked out of the church because he’d done a, b, c, f, j, k, m, p, and q. These things were seriously bad and you could have heard a pin drop in the auditorium. This was going to be a heavy time for the church. We’d never faced anything this intense before. How would it be handled? The speaker had everyone’s attention. No one would forget this sermon. In fact, they’d be hanging out to get home and recount it to others. The second announcement was that there was no such person as Tommy. He’d made him up! He wanted to get us thinking what should we do, what would we do, if these things actually happened. You might argue that the intro was ‘gimmickry’, however I’d respond that it moved me quickly and directly to the weight of the issue. This was more than a trick to get my attention. It persuaded me why I needed to listen. I heard it over 20 years ago, and I think it remains one of the stickiest sermons I’ve ever heard. Because he got my attention and held it, I can even remember the main point and the passage of the Bible being taught. Getting people’s attention is one thing. Keeping it is another. Too many messages start well, and then deteriorate into boredom. We need to maintain people’s interest. The ideal way to do this is to create mystery, to breed curiosity, to show a gap in the audience’s knowledge that they want filled. It’s this gap that holds people’s attention. This is why people will keep watching a B grade movie to the end. They want the gaps filled and the tensions resolved. This means we need to highlight gaps in people’s knowledge that they want filled. Rather than simply filling their minds with facts, we want them to be seeking answers to their own questions. If we want our ideas to stick we should err toward concrete ideas rather than abstractions. A V8 engine is concrete, whereas a high performance motor is abstract. A tightrope walker above Niagara Falls is concrete, whereas stepping out in faith is abstract. Engineering drawings are abstract, whereas walking onto the factory floor and showing where the part should go is concrete. The authors argue that concreteness is the easiest of the six traits to embrace and that it may also be the most effective. Why do people believe ideas? There’s a multitude of influencing factors. We’re influenced by our parents and friends. We believe because we’ve had experiences that lead us in this direction. Our religious beliefs have an impact. We believe because we trust authorities on the matter. People develop core beliefs that operate like a set of gates allowing them to accept or reject new ideas. If we want to persuade a skeptical audience to believe a new message, then we face an uphill battle against so many other influences. External authorities, such as an expert or a celebrity, can add weight to a message. The trouble is we don’t always have access to such authorities. At these times it’s important that our ideas have internal credibility. They must be logical and coherent. They need to stand up for themselves. This approach resonates with how I should see communication about God working. The external authority is God himself, but if people don’t recognise his authority, they can at least test the claims. They don’t need to begin with accepting the divine authorship of the Bible, but can ask questions of verification. One area of internal credibility has to do with “does it work?” I want to encourage people to check out Jesus. I argue that he makes a huge difference to people’s life. I explain the difference he has made to mine. And I invite people to check him out for themselves. Does he make a difference? Believing credible ideas isn’t enough. People need to care if they are going to act in response. Much of this chapter seems to be about appealing to people’s self-interest. People are motivated if they feel they’re going to get something out of it. Appealing to people’s self-interest gets their attention. An old advertising maxim says you have got to spell out the benefit of the benefit. In other words, people don’t buy quarter-inch drill bits. They buy quarter-inch holes so they can hang their children’s pictures. (p179) This is the WIIFY – what’s in it for you – aspect of advertising. The authors argue that good communication needs to include this aspect. People need to have their needs engaged if they’re going to buy into the idea. There are principles here that are more than appealing to selfishness. It’s more to do with people understanding their need to engage with the ideas. That it matters. To them. This is more than facts and figures. It’s more than analysis and reason. It’s about making things personal, showing how much they matter. The authors have identified that people care more about the particular than the pattern. Like Mother Theresa’s comment: If I look at the mass, I will never act. If I look at the one, I will. (p203) If we want people to act, then we need to do more than get them to make a rational response. They need to take off their analytical hats. We must show how our ideas connect with something they already care about. We appeal to what they value, who they are, and want they want to become. All this might appear very manipulative, and it certainly could be used this way. We could simply end up reinforcing people’s selfishness by encouraging them to focus on their own desires. However, I think we should reflect on the emotional component of making ideas sticky. The world I come from tends to be very cerebral and doesn’t give much thought as to what moves people. We are emotional beings. Let’s not overlook this fact. We can be very passionate about things that matter deeply to us. Let’s tap into people’s passions as we communicate. Good stories are very sticky. They can provide inspiration that moves people to action. They can help rehearse situations that enable people to perform better when they face similar real life circumstances in the future. A bit like a mental flight simulator that prepares people to respond more quickly and effectively. Stories help anchor important ideas in reality. They could be used to explain the idea, illustrate the idea, or apply the idea. You don’t always have to create the sticky story idea. Sometimes it’s just a matter of identifying them when they come your way. The beauty of stories is that they naturally embody most of the SUCCESs framework. If you’re in the business of communicating ideas that you want to change people’s lives, then read this book. You probably won’t like everything – I didn’t. Some things might clash with your worldview – they did mine. But it’s worth reading. The ideas here are worth considering. Communication is two sided. We can talk and talk, write and write, advertise and advertise, preach and preach… resulting in no visible change. No changed thinking. No resultant action. We can’t control who will be changed by our message and who won’t, but we must not hide behind poor communication. If the message matters then so does the medium. If you want everyone to read something in the paper, then you write a gripping headline and put it on the cover. You don’t hide it away in small print somewhere toward the back. In my role as a pastor/teacher I want to apply myself to my message, but also to improving my modes of communication. What will help people to grasp and retain the message? What will help people to understand why it matters so much? What will inspire people to take action? How can I make my sermons stickier? How can I communicate our vision in a stickier way? These are all questions worth asking. 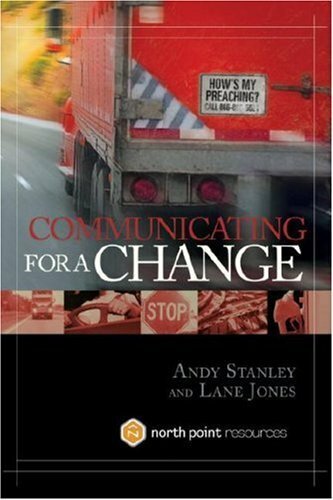 Communicating for a Change by Andy Stanley and Lane Jones is both a joy and disturbing to read. It’s a joy because it’s so engaging and well written. It’s disturbing because it asks serious questions about how well our sermons are communicating with people and what difference they’re making to people’s lives. The book is written in two parts with very distinct styles. It begins with the story of a truck driver training a preacher in how to communicate sermons that make a real impact! This section is both humorous and persuasive. The second half shows the imperatives for good preaching being worked out in practice. This is where the rubber hits the road, so to speak! He’s critical of approaches to preaching that try to say too much and end up not saying anything clearly at all. Whereas a typical sermon might have three or four different points, an intro and a conclusion, his approach is to keep it to one point. Make your one point, make it clearly, apply it well! This may sound too simplistic. What if the passage of Scripture has three or four separate points? Then, he would say, we have sufficient material for a series rather than a sermon. I seem to remember a certain J. Chapman saying something like this! If the preacher can’t find the one major point of the text, then he has more work to do until the one big idea is clear. Having one big idea does not constrain you to simple five minute, one point, messages. Presumably, the text of Scripture develops a flow of logic to arrive at the big idea. If so, then this will usually offer the best structure for your message. Follow the flow. You may discover three or four sub points, but they won’t be separate and unrelated ideas. Rather, they will develop the argument to arrive at the one big idea. With this image in mind, a sermon outline should be like a map. It guides us on the journey to the big idea. We go from here, to there, to our destination. This is the sermon journey. By contrast, some sermons simply put marks on the map and then talk about the different places. They don’t show us the best routes between places or how to get where we need to go. As a preacher it is humbling to think about how few of my sermons might actually get remembered long after they are given. Most likely, very few. If I was asked what were the four points in my message on Sunday, I might struggle to remember every one (let alone a twelve point sermon I gave once!) But one point, taking things deeper rather than wider, should be different. Determine your goal: What are you trying to accomplish? If you don’t know what you are trying to do with your preaching then you won’t know if you’ve achieved it. I agree with Stanley that our goal should be much more than imparting information from the Bible. I’d argue that we are seeking to apply the gospel-shaped Word of God to people’s lives, for the purpose of God transforming their lives. This is something we ought to be passionate about. People’s lives hang in the balance. 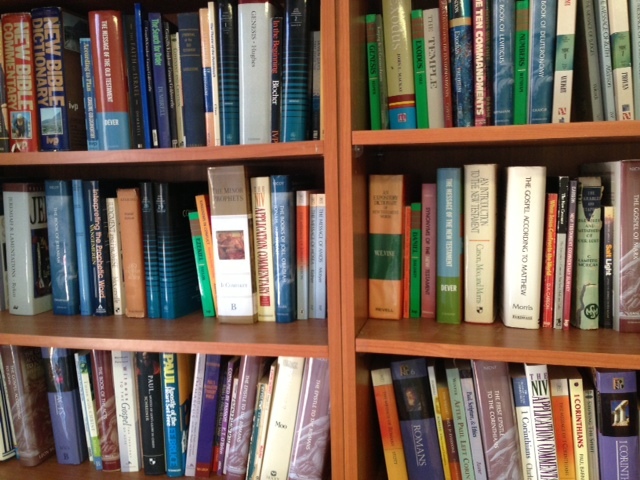 This isn’t take it or leave it theological education. Pick a point: What are you trying to say? The point might be an application, an insight, or a principle. We need to find the central idea that holds everything together. This will lead the preacher to address two questions: (i) What is the one thing I want my congregation to know? (ii) What do I want them to do about it? Stanley calls us to work hard in our preparation, digging around until we discover this central idea, building everything around it, and then making it stick. This will mean omitting material and shaping what’s left to make one coherent point. Create a map: What’s the best route to your point? This template ensures logical flow. It begins by raising issues that connect with the hearers. People need a reason to listen. There should be a tension to be resolved, such that they’re eager to hear how God’s word answers their questions and resolves the tension. This leads to the “So what?” and the “Now what?” questions, before finally casting a vision for how things could be when God’s word is applied. Internalize the message: What’s your story? We’re called to own our message, to internalize it, and to know it personally. Stanley urges us to preach with conviction and passion. There’s something less than persuasive about a preacher who stumbles over their notes, while telling us how important the message is! For the author, this means knowing where he is going so he is not note-dependent. Some things are written in his notes and others are not. The key to knowing the message isn’t rehearsing a text, it’s knowing the map, where you want to get to, and being clear about the key points along the way. Engage your audience: What’s your plan to capture and keep their attention? If communication is to be compared with taking people on a journey, then it’s important that they stay on the bus with us! Stanley challenges the common suggestion that people have shorter attention spans these days. He says the key issue is our ability to capture and hold their attention. If people are on board, can see where they’re going, and they want to get to the destination, then they’ll stay with us. It’s up to the preacher to work hard at being engaging, not to blame people for disengaging. Find your voice: What works for you? Having said, “Be yourself”, Stanley won’t allow us to hide behind our bad habits. We need to work to become clearer communicators. If we’re going to improve then we’ll need to listen to ourselves, seek constructive feedback, and make changes. And keep on doing this! Start all over: What’s the next step? Preachers get stuck. Sometimes we just can’t seem to get to the big idea. Other times we can’t work out how best to communicate it. This is the reality. It doesn’t always come easily or on time! We are ultimately inadequate for the task of preaching God’s word, so we need to learn to depend upon God. It’s only the work of God’s word and Spirit that will change people. I must never forget this. Clever communication is not enough! So what do I make of this book? And will it help our preaching? To be honest, I found it refreshing and stimulating. It made me think again about the earnest responsibility and important craft of preaching the Scriptures. Preaching is something we should take seriously, keep practicing, keep learning about, and be open to making changes. The creative approach of this book models the passion of the authors that we should do this well. It’s God’s precious life-transforming word we’re handling, so let’s give it the respect it deserves. Communicating for a change is a potent double entendre. ‘Communicating, for a change’ is a sad indictment on some preaching. Words are spoken, but the hearers are rarely engaged. ‘Communicating for a change‘ is what we’re called to do. Preach the word so that people are moved to trust God and follow him with their lives. I believe this book can help us to work at clarity in our preaching. Unless you believe that you should be offering a verbal commentary on every detail of the Bible passage, then you will need to be selective in your handling of the text. Being faithful requires you to let the Bible speak, and this means working hard to understand the issues, the logic, and the overall message. It means speaking in such a way as to reveal God’s word, not disguise or veil it. I have some concerns bubbling up as I read this book. The author seems to start mostly from human issues and then find Scriptures to address them. The danger of this angle is that we control the agenda. A book-by-book, chapter-by-chapter, or passage-by-passage approach to preaching forces us to deal with whatever issues God’s word places on our agenda. It keeps me from my hobby horses and it helps me reevaluate my priorities. I wonder also whether it places too much importance on the message being fully memorable. If preaching helps people get into the text for themselves, then as they go back to the passage afterwards (like good Bereans, Acts 17) God’s word should become clearer and more readily applied. Or to put it another way, we don’t want the listener to remember more of what the preacher said than what the Bible says. Surely, the preacher is to fade into the background and let God’s word take centre stage. I think Stanley would agree with me here, and say it’s all the more important we preach with clarity and conviction. I love the call to passion and engagement in preaching. Great preaching warms the heart. Dull preaching puts people off God – and that is not excusable. I’ve listened to some sermons that sound like a person talking about their PhD. They obviously know a lot about the topic, and it means a lot to them, but it hasn’t engaged me or any of the other listeners, it seems. I’m not quite sure why we need to listen or what point the speaker is trying to make. This book calls us to make a priority of engaging people. I’ve never heard Andy Stanley preach, so my assessment of this book is not shaped by the talks he produces. At the end of the day it’s not about the right model or technique. It’s about communicating God’s will to the hearts and minds of others, so that the gospel transforms their lives. This must be theologically-driven. It’s the nature and power of God’s Word that will lead me to handle it with great care and to be deeply concerned about the way it impacts others.